With the somewhat surprising news that Carrie Fisher will be making her final bow as General Leia Organa in Star Wars 9 through unused Star Wars: The Force Awakens footage, attention has, inevitably, turned to the reaction of her brother-in-(missing) arms, Mark Hamill, and how he would react. But we can all breathe easy. The actor behind Luke Skywalker himself, as ever, reacted with poise and class – and has put his weight behind the decision to bring her back. Taking to Twitter, Hamill, is still understandably upset over the loss of Fisher, a good friend, states, “she is simply irreplaceable.” I’m sure Carrie herself would have gotten quite a kick out of the only person being able to replace Carrie Fisher being... Carrie Fisher. Of course, attention now turns to just how much of Star Wars 9 will feature both Leia and Luke. 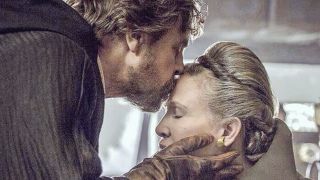 We’ve already had the chance to say goodbye to Mark Hamill’s character in Star Wars: The Last Jedi but bringing him back and, hopefully, having him side-by-side with Carrie Fisher’s Leia one last time would not only be the perfect trilogy-topper, but a beautifully sweet sayonara to the original movie and everything that came after it. It feels like Hamill is somewhat looking forward to that moment, too. We’re not taking the Star Wars: Rogue One CGI route, either. The final chance we, the audience, and Luke Skywalker will get to say goodbye to her will when we’re all face-to-face with Carrie Fisher’s very real, inimitable, fiery spirit. And there won’t be a dry eye in the house. For more on the franchise’s future, check our out list of every new Star Wars movie on the way in the coming years.